If you're anything like me, you really indulged over the . And of course, there's nothing wrong with that, but now as we venture into the new year, I think I speak for all of us when I say our bodies (and our minds) are ready for a . I've been diligently packing my with healthy options and returning home from work genuinely excited to make dinner (we'll see how long that lasts) so when new , landed on my desk, it felt like the universe was listening. The main thing I took away from this cookbook besides the fact that they're all healthy (and it's visually stunning) is how easy these recipes are to make, not to mention quick. They feel really do-able with ingredients we all have in the pantry which I believe has been the biggest downfall of many other healthy-focused cookbooks I've read in the past. But don't take my word for it. Paltrow shared four exclusive recipes with us from the new book to celebrate the launch. So get cooking tonight and please tag us on Instagram with your finished meal if you do #MyDomaineEats. "Spring in a bowl, this crunchy-salad-meets-grain-bowl is all I want to eat for lunch when it turns warm outside." Divide the quinoa between two bowls. Top each with half the asparagus, carrot, radish, chicken, and bok choy. Garnish with the cilantro and pour over the miso dressing. Drizzle with the coconut aminos and sesame oil and serve. "Miso is one of my favorite ingredients. Switching to chickpea miso—which is made by fermenting chickpeas instead of soybeans—allows me to enjoy it even when I’m eating clean. You can find chickpea miso in most health food stores and online." In a small bowl, whisk together the miso, ginger, lime zest, and lime juice. While whisking continuously, slowly add the olive oil, then whisk until emulsified. Taste and season with salt. Cover and store in the fridge for up to 1 week. "Frittatas are perfect for using up veggie scraps. When testing recipes for this book, I used a lot of beets (beets and I were having a moment), so I always had leftover beet greens around the kitchen. I tried adding them to a frittata with some shallots, and it was a hit." Preheat the oven to 375.F. "A friend of mine told me about this soup she’d had at a Peruvian restaurant called aguadito de pollo that was a vibrant green color from all the cilantro in it. As a lover of cilantro for its unmistakable flavor, I had to try to make my own version of the soup. After tinkering a bit and swapping out the rice for cauliflower rice, I landed on a soup that was equal parts light and satiating. Cilantro is said to have chelating properties—meaning it may help the body get rid of heavy metals—and is generally thought of as a cleansing herb in the Ayurvedic tradition. This is the kind of cleanse-friendly food I’d eat whenever." In a medium soup pot, bring the stock to a simmer over medium-low heat. Add the chicken and salt and cook until the chicken is opaque and fully cooked through about 20 minutes. Remove the chicken and let cool. and joints—but if you can’t find them (or if they freak you out), you can absolutely skip them. Ideally, though, you want whatever chicken pieces you’re using to be organic and pasture-raised. Place the chicken pieces, chicken feet (if using), carrot, celery, leek, peppercorns, and bay leaf in a very large Dutch oven or stockpot. Add the water and bring to a simmer over medium heat. Skim off any scum from the surface with a ladle, then reduce the heat to maintain a very gentle simmer and cook for 1 hour, skimming the surface every 20 minutes or so. Fill a large bowl with ice and set a second large bowl on top. Strain the stock into the large bowl, discard the solids, and let cool. "So simple yet so delicious, this scramble is easy enough to make for breakfast every day but would fit in on a Mother’s Day brunch spread, too." Heat a 10-inch nonstick skillet over medium heat. Add the olive oil, scallions, and spinach and season with a pinch of salt. Season the eggs with a large pinch of salt and a good amount of pepper, then add them to the pan. 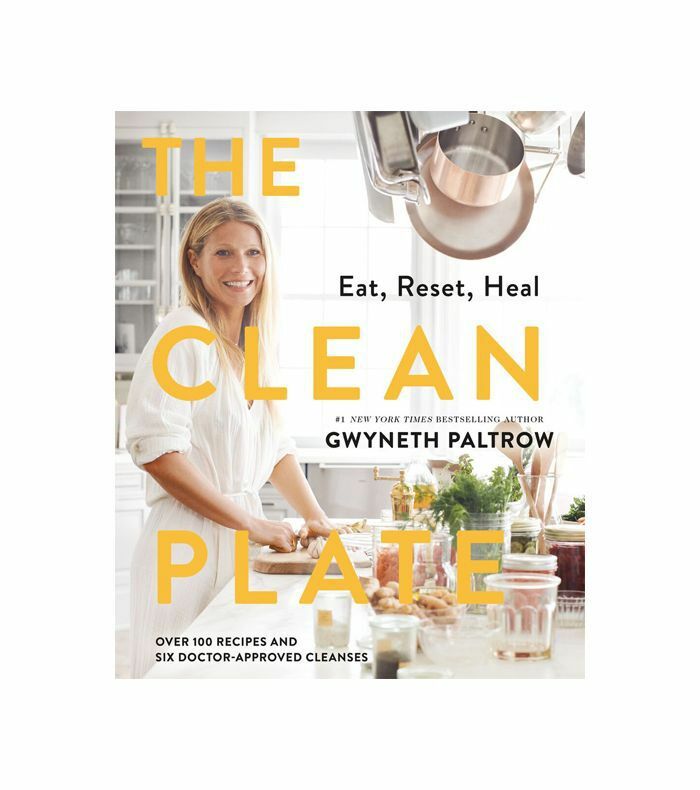 Excerpted from the book The Clean Plate: Eat, Reset, Heal by Gwyneth Paltrow. Copyright 2019 by Gwyneth Paltrow. Reprinted with permission of Grand Central Publishing. All rights reserved.